This week’s Simpsons hurt. While the writers lobbed joke after joke at the screen, not a single one landed. All of that flop sweat masquerading as zaniness was cringingly unfunny. The “Golden Years” dance party that capped it all off was like a surrender flag from a weary battalion after a long and bloody battle. They had tried their damnedest to make this premise funny and even remotely worthy of being a Simpsons episode, but they did not prevail. It was a stupid episode, and they had painted themselves into a stupid corner. Even in these, the latter days of The Simpsons, most episodes can find at least one funny thing to offer viewers in their 22-odd minutes of trying. This one did not meet even that low, low standard. It would be easy to blame the plot for this. In the A-plot, Bart teams up with Martin Prince to make a robotic seal for the science fair. The seals are adorable, but a little minor rewiring will make them vicious killers. A shadowy cabal of funeral home directors and flower shops are unhappy because the seals give the elderly some hope and a reason to live, so they switch the seals to their attack mode. Bart and Martin team up with Professor Frink and the nerds from “Homer Goes To College” to remotely reprogram the seals and return them to the retirement home. Yep, that was the A-plot. In the B-plot, Homer suddenly has an assistant named Roz who betrays him when he slacks off work to go see Paul Flart: Water Park Cop. Yes, they are bravely mocking a notoriously bad film from 2009. It’s doubtful that Kevin James has a sense of shame in the first place, but even if he did, this is miles and miles from the sharp satire that would cause his ears to finally burn. Anyway, Roz becomes Homer’s boss and proceeds to abuse her power with impunity. Fortunately, Ned Flanders knows that Roz hates hugs. Homer convinces Mr. Burns to try to hug her at an assembly, and Roz goes ballistic. Burns fires her, and order is presumably restored. These are both amazingly dumb plots, but the show has managed to eke some laughs out of dumber ones. The problem here is that the episode tries to do a lot with very little. Take the A-plot. There is some comic potential in having Bart team up with Martin for the science fair. The robot seals? Maybe not so much potential for the funny there. Having a cabal of funeral homes and flower shops could bring some laughs, but the way they were presented was just not good. It seemed like a mafia joke at first, but it didn’t go anywhere. Professor Frink is often a funny character, but by having him be super-competent and an object of desire is a reversal of the way that he is usually presented, and it’s not a particularly clever one. Similarly, there’s some comic possibility and resonance in having Homer stabbed in the back at work. Many people have been stabbed in the back by an ambitious colleague. Unfortunately, Homer may not be the best character to give this sort of storyline a heart. Homer is a bad employee who deserves to be ratted out by his subordinate. The fact that she is selfish and mean doesn’t add to this story. Yes, that is the sort of person who would stab someone in the back for their own gain, but yes, Homer also had it coming. Where is the joke? 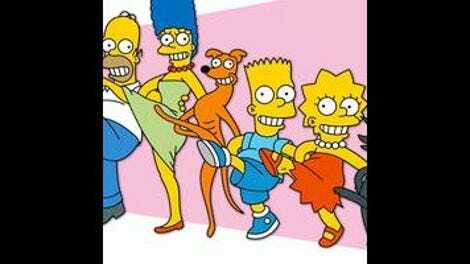 The episode tries to distract viewers from the missing jokes with a few appearances from beloved (or, at least, familiar) minor characters, like Dr. Nick, Itchy and Scratchy, Professor Frink, and Jasper. There’s also a brief shot of Bender from Futurama and a number of DVR-friendly fly-by jokes. However, familiarity is not the same thing as funny, and these feeble attempts to generate goodwill just add to the desperation. If a Simpsons episode has no bite or laughs or discernible emotion, it is simply a lousy way to spend a half-hour. This took an incredibly long time to write. While it’s fun to joke about how far The Simpsons has fallen, it is no fun to pick at a lackluster episode. If this were an episode of a series that had never been great, that would be one thing, but man, considering all of the money and talent that went into this thing is downright depressing. Chalkboard gag: It’s November 6th. How come we’re not airing a Halloween show? What was the deal with Marge being in the shower and then shaving her legs in two different scenes? Those shots seemed so random that there should have been some comic payoff, but no. It just fizzled. Martin is apparently bisexual. Okay. Besides Bender on the cover of Popular Robotics, the other things on Bart’s desk include a Six Million Dollar Man DVD and copies of Dog Fancy, Robot Fancy, and Fancy Robot-Dog Fancy magazines. Other science fair entries include: The Science of Why Are You Hitting Yourself by Nelson, Is This Uter? by Kearney (with an arrow pointed at a skull), and Stuff Doctors Had To Pull Out Of Me by Ralph (with scissors, green army men, and a troll doll). Since Agnes Skinner tells Seymour that she carried him in her stomach for four-and-a-half months, does that mean that the awful show where the real Seymour Skinner returns has been written out of continuity for good? Old men want heroin, apparently. North American Man Bot Love Association.